Our CT3000 filters safely and effectively remove microorganisms like Giardia and Cryptosporidium from your water protecting you and your family from parasitic illnesses caused by these contaminants. Efficient and easy to use, our CT3000 Countertop & Under sink Water Filters provide 1500 gallons (four to six months worth) of quality water and connecting directly to your tap, this water filtration product is convenient and practical. This unit will purify up to 1500 gallons of water by removing lead and other heavy metals as well as chlorine, bad tastes and odors. The newly designed CT3000 is user friendly with design simplicity in mind. It requires no tools for filter changes. Replacing the filters on this system is one of the easiest to do. Quick-change filter cartridges make cartridge replacement fast, clean & easy, without contact with used filter material . Complete 3- stage water filter system. 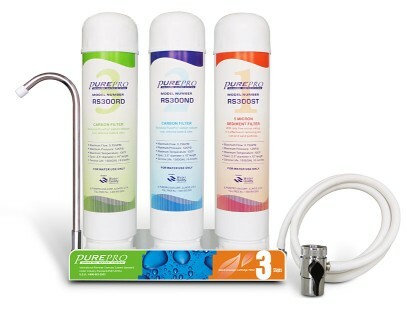 PurePro 3-stage water filtration systems are the most advanced home water systems in the world. You get clean, safe, clear, healthy, great tasting water at every tap in your home. No electricity needed. No wasted water.